Things have been a little crazy around the Real Food kitchen lately. Rumor is we’re moving! I suppose its not much of a rumor anymore, but it is true. At least it will be when the paperwork is signed on Thursday. As excited, ecstatic and elated as we are about moving it means that most everything except the kitchen is in boxes. I’ve made plans for it to me the last thing packed up and the first thing unpacked. (Have I mentioned the kitchen is the size our our current living room!!) Even so, its stressful to cook when your living room is blank mess of cardboard boxes which means we have been eating an unusually high amount of take-out. Normally I love take-out, it means I get a night off and I get to eat my favorite foods that I can’t or haven’t dared to try to cook. Indian, Thai and Chinese are some of the usuals on out menu. But tonight, tonight, take-out couldn’t fulfill my craving. You see, I’ve found one of those recipes that no one can make as well as I can especially not a restaurant. 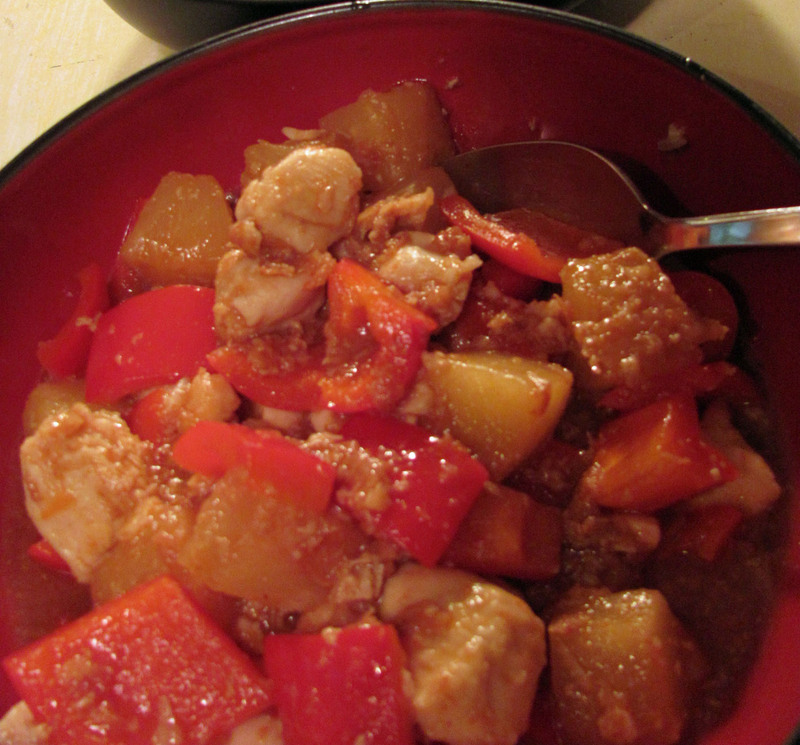 Ever since I was a little kid one of my favorite food has been Chinese take-out Sweet and Sour Chicken. I love it in all it gloopy orange goodness! Well I did until I found a recipe for a homemade version that has all of the tasty qualities of the take-out with out the questionable meat and deep-fried aspect. Before we started packing out house into boxes I spent several hours pouring over The Steamy Kitchen Cookbook by food blogger Jaden Hair. 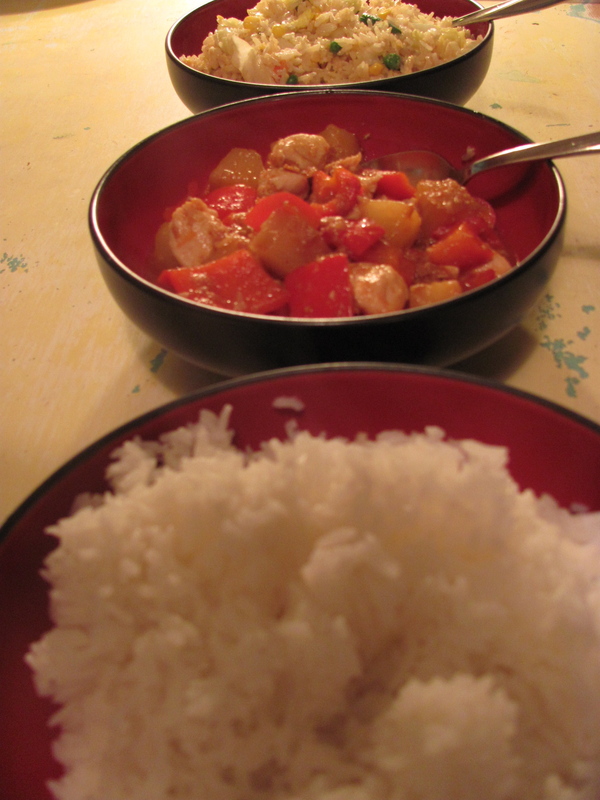 Since then we’ve made this homemade sweet and sour chicken at least once a week for the past month, it’s that good. Which brings me to Wednesday night and my all time favorite take-out food, Indian chicken tikki masala. Wednesday night all I wanted was homemade sweet and sour chicken and I settled for tikki masala, I just didn’t have the time to cook dinner. I can’t believe I feel like I settled for tikki masala, I love tiki masala! I feel bad just saying that, but its true. Lucky I managed to make Sweet and Sour chicken Thursday afternoon before I went to work but I was in such a rush to get it done I forgot to add the brown sugar! Oh well, I’ll give it another go once we move in. If your house isn’t in boxes I highly suggest you finagle this into your weekly dinner line-up and enjoy a bite for me! 2 to 3 tablespoons brown sugar, depending on how sweet you want it. In a glass bowl, combine the chicken with the egg white, salt and cornstarch. Stir the chicken to coat evenly, let stand for about 15 minutes at room temperature. While the chicken rests, whisk together the pineapple juice, vinegar, ketchup, salt, and brown sugar. Heat a large frying pan or wok over high heat until a bead of water instantly sizzles and evaporates. Pour in the 1 tablespoon of cooking oil and swirl to coat. Add the chicken and spread the chicken out in one layer. Let the chicken cook, untouched for 1 minute, until the bottoms are browned. Flip the chicken and cook the other side for 1 minute. The chicken will still be pinkish in the middle. Dish out the chicken onto a clean plate, leaving as much oil in the pan as possible. Turn the heat to medium and add the remaining 1 teaspoon of cooking oil. Let the oil heat up and then add the bell pepper chunks and ginger. Cook for 1 minute. Add the pineapple chunks and the sweet and sour sauce. Turn the heat to high and when the sauce is simmering, add the chicken pieces back in. Let simmer for 1-2 minutes, until the chicken is cooked through. Check a piece of chicken to see if its still pink, if it is return it and let it all cook a few more minutes. When the chicken is cooked through taste the sauce and add more brown sugar if you’d like a sweeter sauce. Serves 3 for dinner with rice. This entry was posted in entree, poutry and tagged chinese, entree, poutry. Bookmark the permalink.